The unthinkable has happened, folks, Nokia announced its switch to Windows Phone for its high-end devices in what could turn out to be one of the biggest changes in the industry. In regards to that the company is changing its structure and basically will have two separate units as of April 1 - Smart Devices and Mobile Phones. The first one will be responsible for high-end offerings, which are expected to run the Windows Phone OS, while more affordable handsets presumably with Symbian will be the focus of the Mobile Phones department. The Mobile Phones unit will be lead by Mary McDowell and will be responsible for the more affordable handsets, presumably running Symbian S40. 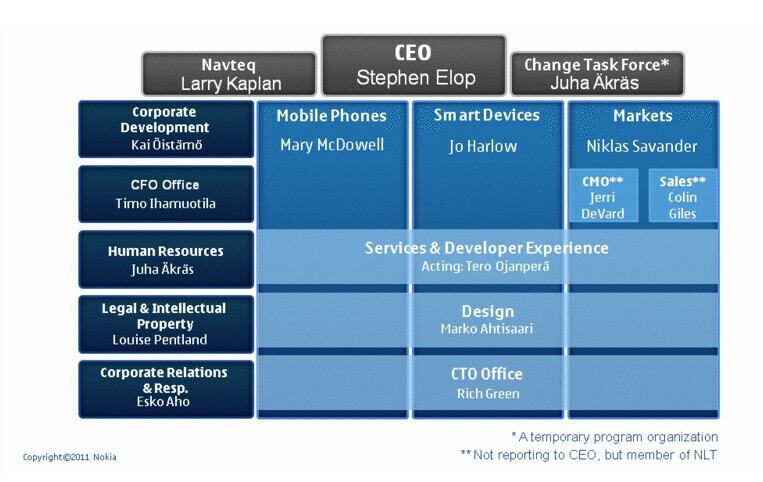 The previous Group Executive Board will now be known as the Nokia Leadership Team and will include Stephen Elop, Esko Aho, Juha Akras, Jerri DeVard, Colin Giles, Rich Green, Jo Harlow, Timo Ihamuotila, Mary McDowell, Kai Oistamo, Tero Ojanpera, Louise Pentland and Niklas Savander. Those names indicate an even wider presence of Americans as the company is expected to increase efforts at the North Americn market. Alberto Torres, one of the main people behind the MeeGo project steps down to “pursue other interests outside the company,” which means MeeGo will turn into an “open-source, mobile operating system project.” Presented with a single handset in 2011, the platform will be used for market exploration of next-gen devices rather than current products. Highly expected from Elop. I guess we'll expect meego devices later. I just wished they pushed for android though. Today is a sad day... Rather than shake up management and expedite Symbian and Meego around QT; Nokia's CEO decided to appeal to the blind masses. I'm sorry to hear this news, because part of the reason why I loved Nokia was having something different than everyone else... Now I'm at a crossroad which I did not want to be at. Thanks a lot previous Nokia Management and Corporate personnel; you were responsible for this, not Stephen Elop! He didn't force Nokia to loose market share and value; you did! I agree android or webOS were the good choices; WP7 is not as advanced as Windows Mobile (a OS from years ago), just flashy graphics. I think nokia will soon become just a memory from the past. Too bad, it was a good brand. I just dont get it. Why not push a strategy of Meego instead of just saying it will come some day? Apple didnt transition into smartphones by using another companies OS and Android first came out as a GOOGLE phone. why not introduce Meego as the end all be all of Smartphone OS' and launch a strategy on how to capitalize on it? The funny thing is that if they will push meego soon "it might not be so competitive" but waiting for two years to transition to WP7 si "really competitive". Verrrry funnny. Maybe in 2 years there will be available the great innovative breaktrough function named "copy - paste". I find this insulting, for Nokia to try to spin this off as "exciting news"!... I bought a Nokia for its Symbian OS, if I wanted Windows Phone OS I would of bought something from HTC or Samsung! 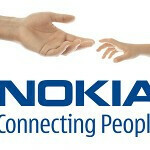 Nokia and Symbian was a choice for us, now we are left with no choice! Symbian isn't broken, it's the upper management that failed to plan and execute that's broken. Meego was also miss-managed, it was meant to compliment Symbian in the tablet/netbook segment; thus creating a complete eco-system with the Qt framework as the link to manage both platforms growth. Mr. Elop was suppose to shake up management and expedite this plan, not kill it off and give up Nokia's assetts to microsoft!